A covered call writing-like strategy involves buying deep in-the-money LEAPS options and then selling short-term slightly out-of-the-money call options. Leaps become a stock surrogate. The term Leaps stands for Long Term Equity AnticiPation Security. They have expiration dates up to 2 1/2 years out. Ideally, we would like share price to rise $0.01 below the $65.00 strike and having the short call expire worthless. Here we would have generated $2.00 in option premium plus $4.99 in unrealized share appreciation. We can then write another short call. Our maximum loss, if share price moves to $0.00 is $22.00 – $2.00 = $20.00 per share. This, of course, assumes no position management, an unrealistic assumption for Blue Collar Investors. We can close both legs of the trade for a small gain. We may also opt to take no action in hopes of the option expiring worthless if share price remains below the strike price. We can close both legs of the trade for a small loss. We may also decide to take no action if the decline is minimal and write another call the next month. This is where our management skills come into play. Let’s say the share price moves up from $60.00 to $68.00. As expiration of the short call approaches, the premium will be slightly above $3.00, say $3.10 ($3.00 of intrinsic value + $0.10 of time value). The $40.00 LEAPS is $28.00 in-the-money plus has a larger time value component, let’s say $1.50 for an estimated premium of $29.50. Now, if we exercise the LEAPS and sell the stock for $65.00 from short-call exercise, our net gain in $25.00. However, if we close the spread by buying back the short call for $3.10 and sell the LEAPS for $29.50, we have a net credit of $26.40, an additional profit of $140.00 per contract. We do have one other course of action here. We can roll the option to the next month $60.00 call or roll out-and-up to a higher strike. The calculations will dictate whether this latter strategy meets our goals. Difference between the two strikes + premium generated from the short call must be greater than the cost of the LEAPS option. We will need special approval to use this strategy, probably a higher level of approval than for traditional covered call writing. We will be asked about our goals, risk tolerance, knowledge of options trading as well as portfolio balances and net worth. These requirements are broker specific so we must ask our broker for this information. As a general rule of thumb, traditional covered call writing is permitted in self-directed IRAs but LEAPS covered call writing is not. Using LEAPS as a stock surrogate with covered call writing has its advantages and disadvantages. Each investor must measure his own risk tolerance to make a determination as to whether this strategy has a place in the family portfolio. Contest #1: What will be the value of the S&P 500 by year’s end? Prizes in each category (total of 6). Donation to the USO (United Services Organization) of $5000.00 worth of books. For the week, the S&P 500 rose by 0.20% for a year to date return of 0.99%. BCI: Cautiously bullish using an equal number of in-the-money and out-of-the-money strikes. I have traded in LEAPS for some time, buying ITM and selling same date OTM calls, with some very favorable results, and others barely breaking even. Some people call them “Bull Spreads” but my broker cals them “Debit Spreads”, and they are within my approval level. When I click on the second leg box, the same date option chains are shown automatically, and therefore, I believe that my approval level will not allow the “Diagonal Spreads” as you explained. If I will need the next level of approval, it means to me that there is additional risk involved, and I am always worried about my lack of experience. Thank you for sharing this strategy with us. Brokerages can vary as to how they define levels of trading approval. They have become quite sensitive to their fiduciary responsibilities because of the increased scrutiny by the SEC and FINRA. This enhanced surveillance by government and exchange agencies is aimed at protecting retail investors. I present alternative strategies to our premium and general members for educational purposes. There is no one strategy appropriate for every investor. My main “go-to” strategies in my personal portfolios remain conventional covered call writing and selling cash-secured puts. 80% of my investing dollars are dedicated to your conventional covered call monthly method, and I follow all the rules in your book rigorously. Your method works very well for me, and I hope to make less mistakes in the future, especially during correction periods. Roni, wise move not asking for added options approval in your account until you are clear what you want to do with it understanding all risks. Alan, thanks for mentioning I suggesting our year end contest. But it was you, Barry and the Team that took it and ran with the video, the add on rationale and connecting it to the Wounded Warrior Project. as you told me some time ago, “there are no old and bold pilots”. I also loved your last week axiom in options trading: “Buy time don’t sell it”. This week’s Weekly Stock Screen And Watch List has been uploaded to The Blue Collar Investor Premium Member site and is available for download in the “Reports” section. Look for the report dated 10/30/15. I have sold several naked put options based on the weekly list you put together. I have noticed that the price to BTC the put options I’ve sold are sometimes increasing in cost, even thought the price of the underlying stock is rising (as I’d hoped it would). I fully expected that the cost of buying the put option back to close it would go down, not up, when the underlying stock price increased. What is happening? There are 3 main factors that influence option premium: Delta, Theta and Vega. Delta: As share price increases, put value decreases as you suggested…not that one. Theta: All options have time value erosion…not that one. Vega: As the implied volatility increases, option premiums increase…probably the culprit. Admittedly, it would take a significant increase in Vega to overcome the forces of Delta and Vega, so I’d recheck the accuracy of the options chain you looked at to be sure. Thanks for your response. It has to be the Vega; but the options chains are accurate. They’re all 11-20 explorations; and they’re going in the same direction as the stock (up). I definitely didn’t expect that. Not sure what the point of these are. I bet that they’d go up…they did, and I’m losing. Let’s view this through rosier glasses. You sold a put to generate cash…so far so good. You only start losing money if share value drops below the strike by the amount of cash generated from that put sale (assuming you sold an OTM put). So now put value is increasing despite share value increasing (weird but possible…Vega effect). There is no requirement to buy back the put. You can let it expire worthless and have a successful trade with a happy ending. As an example, let’s say you sold a $60.00 put for $2.00 on a stock trading at $62.00 and share price appreciated to $65.00 as put value inexplicably went to $3.00. The put holder is not going to exercise and opt to sell their shares to us at $60.00 when they can be sold at market at $65.00. The option expires worthless and we now can use that “freed up cash” to secure another put the following month…all is well is optionland! I was so stuck on BTC that I didn’t think about letting them expire. That helps on OZRK, as I sold a 45 put. I sold a 57.50 put on CALM and a 30 on LGIH, all 11-20 expiration date. LGIH is near the money, but CALM has a ways to go. That stock is up $1.24 right now today; but the option is also up $.10. Thanks for the reminder! your great tip on ATVI is bearing fruit. If you remember, I bought the stock last Monday Oct 26 at 34.91, and sold the Oct 30 35.00 calls for 0.38, aiming at 1% ROO. The calls expired worthless, and I placed a sell all order with a 35.00 limit yesterday, which was not filled. I intended to try to sell again today, because ATVI was supposed to post earnings today, Oct 03, after the bell, and I was not willing to risk it through earnings, but……..as you know, they posted earnings yesterday, and fortunately I got very lucky. ATVI is trading at 37.00 as I am writing this post, and now I am very happy, but I do not know exactly what to do next? Do you have any recommendation? I’m very pleased for you and other members who owned this security. There was a positive surprise on this early announcement as well as news of its purchase of King Digital…the market reaction was quite favorable. I cannot give specific financial advice in this venue but I can tell you that in our BCI methodology if we held a stock through an ER, we wait for price reaction volatility to subside and then write the call as if it were any other stock in our watch list. Finally and respectfully, when I post a “Running List Stock in the news” comment please don’t construe it as a tip or recommendation but rather an interesting side story to an eligible stock on our watch list. I will frequently, but not always, own these securities in my own portfolios. Keep up the great work and thanks for sharing your recent success stories. Thanks Alan for prompt response. It helps a lot for my decision. For buy-write strategy, how do you minimize the loss due to unexpected huge drop in the share price ? For example, recent drops in SNDK and IBM in a matter of few days and the share price stays at about the same level since then .Do you buy a put option to protect the downside of the stock while selling covered calls ? The problem of buying a put option is the additional cost involved which can only be recovered through selling more covered calls . Would appreciate your guidance please. Mastering the 3 required skills will generally keep us out of trouble when using covered call writing or put-selling. The underlying must have elite-performing fundamentals as well as sound technicals and pass all of our common sense screens. We would never use a stock with a bearish chart pattern for example. We circumvent certain risky events like earnings reports and are always prepared to implement our exit strategies when the opportunity arises (20%/10% guidelines for a declining stock). Protective puts will avoid catastrophic share loss but, as you said, are costly. I, personally, don’t use protective puts but feel that there is nothing wrong with buying an insurance policy if you will sleep better at night. The bottom line here is that we are all looking to generate higher returns than the risk-free returns of say Treasuries. This means we are willing to undertake some degree of risk. In our BCI community, we take every conceivable measure to avoid risk but are always prepared to deal with it in a non-emotional manner should it present itself. The only ways I know to mitigate individual stock risk without buying insurance are have many of them or own ETF’s :). Another is remember your time horizon. If you plan to own SNDK and IBM for the long haul because you like their business models and market sectors that requires a stoic chin. Take the punches. Note that several of the eligible candidates have high implied volatility. Check pages 7 and 8 of the report to decide if these candidates meet your portfolio needs and personal risk-tolerance. Re-enforcing our earnings report rule…..
CELG and LCI even more so. Just a short note to let you know the latest from “Preacher” John. First, I no longer promote ROLL Ups. I may still use them if the market/stock conditions are right AND if the stocks gains in “intrinsic value versus the Buy back costs don’t satisfy the Mid-Contract Unwind criteria! Of near zero. Otherwise I’m completely sold on the Mid-Contract Unwind exit strategy because within the last two days I have utilized it twice with GREAT results. First was with HAWK where its 40 call gave me an ROO of 3.1%. It increased from $40.48 to $43.84 and after doing all the calculations I decided to do MCU. I bought it back and sold where my Net gain to Unwind the position was 2.1% but my second stock was PAYC which I bought at$39 , the call of which gave me an ROO of 5.5%. The time cost to close was only$0.40. These were 500 share transactions so a very nice profit was realized. The very next day, PAYC increased to $45.92. Again I did some calc’s and using BOFI as my second soldier I realized another Net gain on the Unwind of $2.76/s plus an ROO of 4.5% on the BOFI 90 ITM call. Here my time lose to close was only $0.36! It was very unusual that these two Mid-Contract Unwinds occurred in two consecutive days. Again, in day 1 I sold HAWK and bought PAYC and the next day I sold PAYC and bought BOFI. I really appreciate your review and comments on my erroneous ROLL UP examples. Taught me a very valuable lesson!! I’m a MID-Contract Unwind BELIEVER NOW and forever. 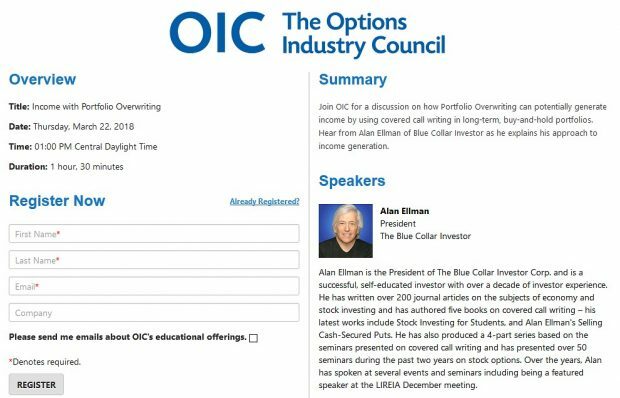 You’re a true Blue Collar Investor and a great spokesperson for the BCI methodology. I’m sure your students in Mexico appreciate all the hard work and dedication you’ve invested on their behalf. I love your posts. Please keep them coming! A back test I find helpful is look at my results on covered call stocks versus simply holding them uncovered. Without exception I do better in up markets with up stocks not writing calls. They only help my losers..
What do you think about dec rate hike’s impact on our current stock & call? Janet Yellen has all but telegraphed a rate hike in December probably of 25 basis points. I believe that is already factored into the market and may actually be a relief to those who are against a zero Fed fund rate. I view it as a neutral to slightly bullish event…one man’s opinion.